The young Italian shipyard C.Boat, founded in 2007, announces two recent orders for motor yachts exceeding 27 metres. Based on the same naval architecture as motor yachts Aria (2009) and Olibamo & Co (2011), the first of the two recent orders at C.Boat is for a 27-82 Explorer yacht. 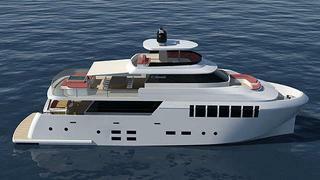 RINA-classed and built in steel to an-house design, this 27.3m explorer yacht will become the first tri-deck built by the yard. The voluminous interior accommodates 10 guests in five cabins including a full-beam master on the main deck and a full-beam VIP on the lower deck. Powered by twin 875hp Caterpillar C-18 engines, she will reach a top speed of 14 knots. Fewer details are currently known for the second order, the one of a C.Boat 28 Sport, a new model developed by the Italian yard. The construction of this 28m raised pilothouse motor yacht is starting at time of writing, and more details will be provided in the near future. The C.Boat 27-82 Explorer yacht is scheduled to be delivered in October 2014, and the C.Boat 28 Sport yacht will be ready in November 2014.